The first time I ever had duck pan-fried and served rare was on a trip to Switzerland. It was cooked at the side of the table, and was one of the most wonderful things I have ever tasted. Food may not be the first thing that springs to mind when thinking of Switzerland; if that is the case, you are in for a treat. Food in Switzerland is made up of French, German, Romansh and Italian influences. Being a land-locked country, fish doesn’t feature highly on the menu, but there are many delightful things instead. 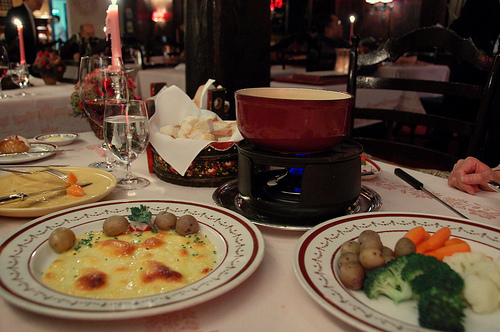 Cheese and potatoes feature highly in Swiss dishes with fondue and raclette being the most popular. 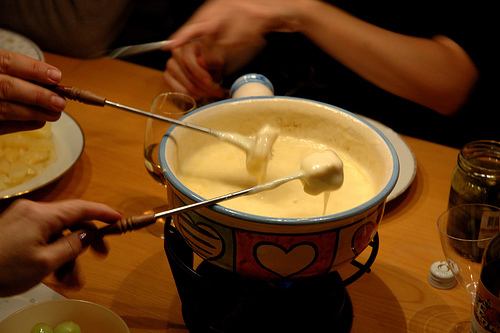 Fondue is a traditional Alpine dish of melted cheese (a mixture of two cheeses, and usually with some wine added, to get it to the right constituency) in a pot in the centre of the table that people dip breadsticks or crudités in. Delicious! Raclette is both the cheese and the name of the dish – it is melted and eaten with potatoes that are boiled or roasted with small onions or gherkins. Sometimes it is also grilled (nowadays, electrical raclette grills are available – a bit like mini sandwich toasters, you place a slice of cheese with ham or whatever else you fancy in your mini grill pan, heat and eat). If that’s not enough to satisfy your taste-buds, try rosti, grated potato, formed into a cake and fried. It sometimes has onion grated and mixed into it and, yes, you’ve guessed, often topped with cheese. Rosti was traditionally a breakfast food, although nowadays, muesli is perhaps more common. I can’t write about food in Switzerland and not mention the chocolate and pastries. In fact, just looking in the patisseries and chocolatiers is a delight in itself. Everything is so beautifully made and colourful. Desserts generally contain fruit, especially berries of one sort or another. It’s common to see open tarts covered with strawberries or tarte tatin or other fruit topped delights. And, you will sometimes find cheese in apple desserts. But the chocolate is reputed to be the best in the world. If you want, you can dine on it all day long – chocolate croissant for breakfast, chocolate tarts with lunch, and any one of a variety of chocolate dishes with dinner. Chocolate mousse with whipped cream, melted chocolate fondue with fruit, chocolate cheesecake, chocolate soufflé, I could go on for hours, but why not just try it for yourself? You won’t be disappointed. If you are planning on Switzerland holidays, you definitely won’t be disappointed by the food so make sure the same is true of your accommodation! If luxury villas sound like your thing browse through the Owners Direct website – there are dozens to choose from. This entry was posted in Food, Travel Tips and tagged Swiss Cuisine, Switzerland. Bookmark the permalink.